Millennials (and their Gen Z juniors) have been giving brands a healthy dose of side-eye since before they had their first smartphones. Even the terms “Millennial” and “Gen Z” are eye-roll-inducing for the over 100 million people who make up those generations. As consumers, they have more power than any other generation, but are the least engaged with brands. Why? A lack of trust. Younger people feel like most brands just don’t “get them”. And it’s not hard to see why. Millennials discover, research and purchase products and services in a completely different way than the generations before them. They buy and interact with brands differently, so brands need to sell to them differently. Authenticity matters to Millennials. If they think you’re not being real with them, they’ll not only dismiss you but it will be that much harder to gain their trust in the future. Do you know who Millennials do trust? Each other. A study by Crowdtap revealed that Millennials find user-generated content (UGC) 35 percent more memorable and 50 percent more trustworthy than other forms of media. This is something Toyota realized when they set out to launch their annual Feeling the Streets campaign, celebrating the street musicians and artists who make the roads their customers travel on a better place. As Kristen Matthew of Media Blanco, Toyota’s Creative Agency, put it, “We knew authenticity was the key. Slick product photography and cheesy montage videos weren’t going to resonate with our core audience of 18-24 year olds.” So instead of using staged visuals, they turned to the real UGC images their fans were already creating. By using real, fan-created content to fuel their Facebook ads, Toyota was able to connect with younger audiences in an authentic way that resonated with them. As a result, they far surpassed their Facebook ad engagement goals – achieving a massive 440% year-over-year increase in engagement. Traditional media and advertising channels have been declining in usage with younger generations, as more digital and mobile alternatives have come along. Instead of watching cable TV, Millennials stream shows on Netflix; as opposed to listening to the radio, they subscribe to Spotify. In order to reach Millennials where they are, brands need to ditch traditional and get digital. When launching their Better Make Room campaign, former first lady Michelle Obama’s Reach Higher Initiative understood today’s students wouldn’t respond to pre-packaged promotions. “When we set out to create the Better Make Room campaign, we knew if we wanted to engage the next generation in a conversation about education, we needed to give them a space where they could drive those conversations themselves,” said Eric Waldo, Executive Director of Michelle Obama’s Reach Higher initiative. 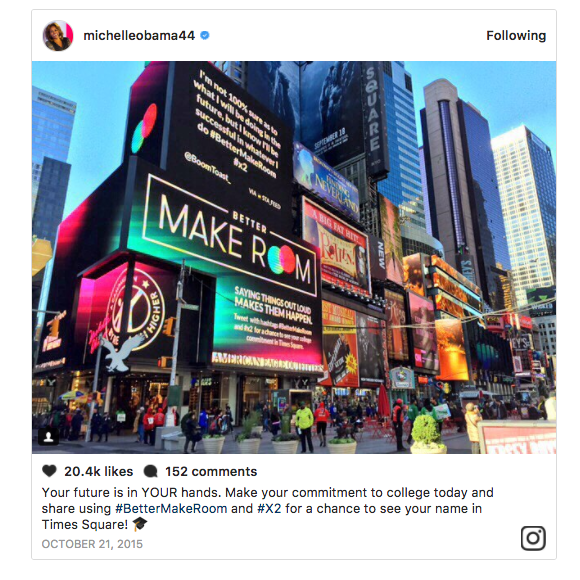 They used social media to spark conversations with students and created interactive digital experiences that showcased real students’ academic stories, accomplishments, and ambitions across the web and on digital billboards throughout Time Square. In the first 24 hours, the campaign had more than 140M social media impressions and over 6,000 commitment interactions made on the BetterMakeRoom.org site. The more digital and on-demand our world becomes, the more people expect products and services to be customized and curated for them. This is especially true for younger generations. Millennials and Gen Z spend enormous amounts of time on social media networks, in large part because the content there is engaging and personally curated for them. That real social content is not only relatable, it’s influential. In fact, 84 percent of Millennials say user-generated content from strangers has an influence on what they purchase. Brands that can tap into that real, engaging content to create more personalized experiences will be able to reach younger audiences in a way that truly resonates with them. 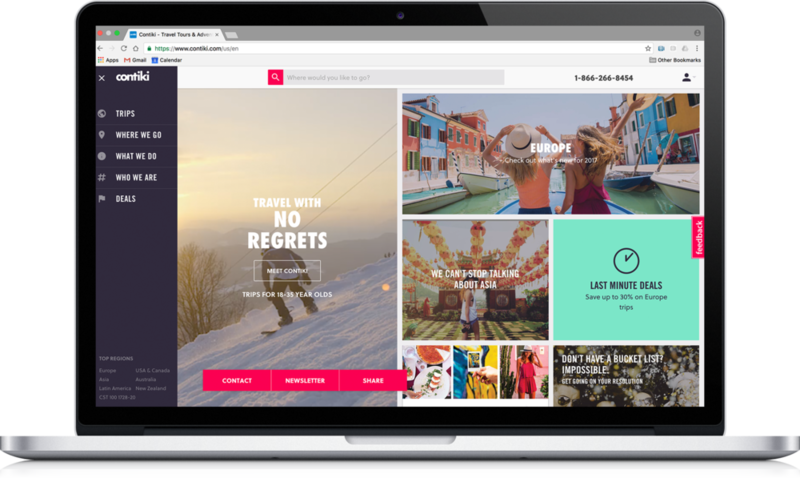 The popular group travel company, Contiki, has mastered next-level personalization by combining real customer content with personalization tools. From featuring UGC within search results as a way to amplify awareness, to driving bookings with UGC on travel itineraries webpages, Contiki improves their digital performance by pulling from a breadth of authentic social content instead of spending over hundreds of thousands of dollars on photo shoots for each of the roughly 350 trips they offer. By having a separate hashtag for each trip they offer, they’re able to source an incredible amount of unique content and personalize it for people across various channels: web, mobile, email, etc. These ongoing programs generate about 7,000 pieces of content per week. Contiki then displayed the images and videos that will resonate best with each targeted audiences. So, a college kid planning to party hop across Europe will see real photos of others who have been at those same parties, while a young professional looking to explore the beaches and reefs of Australia will only see authentic images from those tours. At the end of the day, authenticity can’t just be a “strategy”, it needs to be something your brand embodies. Millennials and Gen Z are natural content creators, and unique social content is the content they trust and want to interact with. 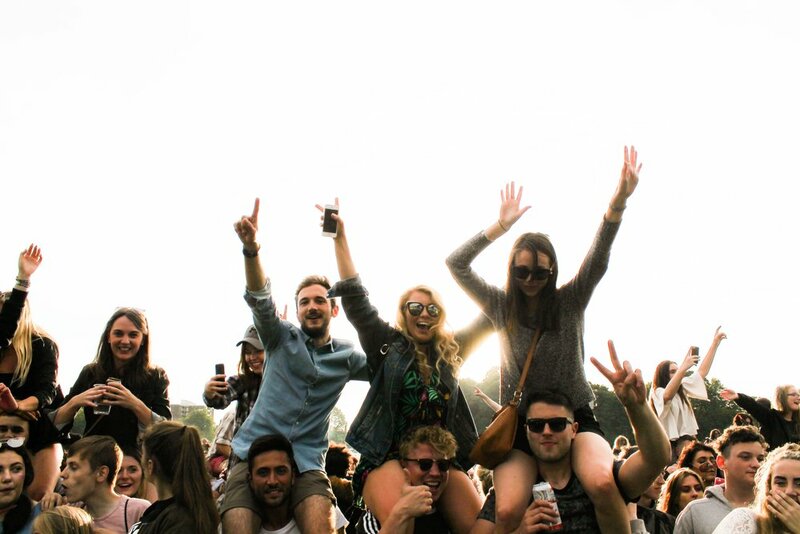 In order to truly connect with Millennials, brands need to start marketing with them instead of at them. Stackla will be hosting a panel discussion 'Stop marketing at Millennials and start marketing with them' at YMS17 NYC this October.